Mere days after fans were up in arms over the first glimpse at the new Sonic the Hedgehog movie by Sega and Paramount Pictures, now they are up in legs. A new poster has been discovered in the wild for the upcoming film, and impressions from the peanut gallery are no more kind to this one than the muscular motion poster. But not to worry, because the screenwriter for the Blue Blur’s cinematic endeavor is telling the fans who are preemptively jumping from bridges in protest to calm down. Nothing defuses an argument by telling the other party to relax, right? While the furor by fans over the first poster is way too premature (at least wait until the teaser trailer before trashing your Sonic amiibos), Paramount certainly isn’t doing much to allay fears that began when the plot for Sonic the Hedgehog didn’t exactly sound like the dream-scenario that video game fans had envisioned since the early 90’s. In the film, an animated Sonic (voiced by Ben Schwartz) flees from the government with the help of a human cop (James Marsden) in the town of Green Hills. The main baddie in the film is Dr. Ivo Robotnik, who is played by Jim Carrey. Twitter user Wario64 broke the newest image, which you can see below. The new poster was seen by a fellow tweeter at a movie theater. Paramount hasn’t vouched for the authenticity of the poster, but it certainly looks the part. I’m not sure what’s going on with his legs (maybe Carrey’s Grinch legs were the inspiration), but the blue trail leading through the arches of the Golden Gate Bridge is pretty cool. Less awesome is the scribble on the beam, which explains, “Sonic wuz here.” Sonic fans are of course taking it upon themselves to tear it apart, ragging on everything from the fur on his legs to his choice in sneakers. Nothing says toxic fandom like hating a movie a year before you see it. 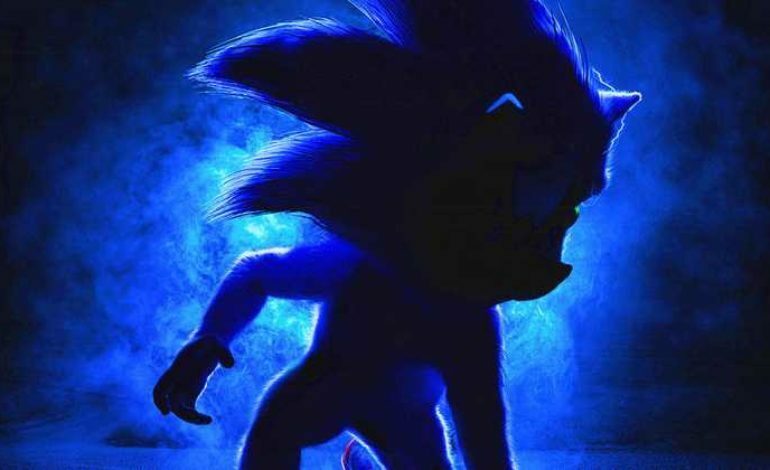 Sonic the Hedgehog sprints into theaters on November 8, 2019. In the spirit of spreading more premature hate, have a peak below at what Sonic actually looks like in the film. This photo is unconfirmed, and of course Sonic’s look may change between now and the release date, which is far enough in the future that you should just relax and hope for the best.